After making the convoluted arrangements for shipping our truck from Panama to Colombia on board a giant container ship we turned our attention to getting ourselves around the Darien Gap, a swath of jungle that creates a 60 mile (96 km) road less break in the Pan-American Highway between Panama and Colombia. We chose to sail through the San Blas Islands. The M/S Independence, our home for four days as we sailed through the San Blas Islands on the Caribbean coast of Panama then on to Cartagena, Colombia. Sure we could have flown from Panama City, Panama to Cartagen, Colmbia. We even found Copa Airlines flights that were going for 10,000 frequent flier miles (one way, per person). 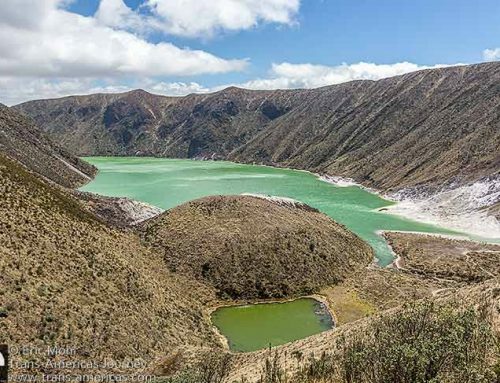 But if our truck had to travel by sea over the most complicated overland border in the Americas then so did we. 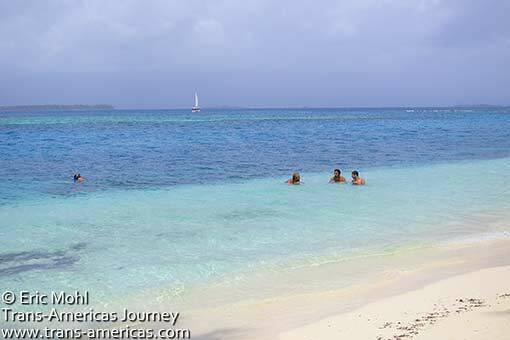 Plus, we really, really wanted to do some sailing through the San Blas Islands and see the spectacular Kuna Yala. Ask a child to draw a deserted island and, odds are, he or she would produce something that looks a lot like one of the 378 islands that make up the San Blas Archipelago off the Caribbean coast of Panama: crystal clear water in a dozen shades of blue ringing white sand mounds with perfectly angled palm trees jutting out of them like some sort of festive cocktail garnish. 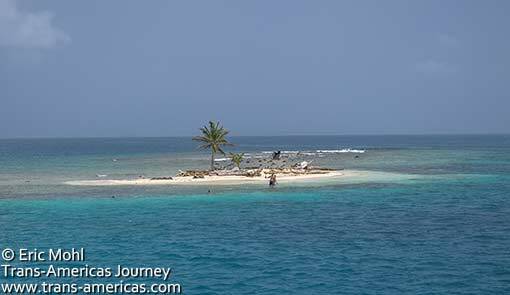 Most of the nearly 400 islands in the San Blas Archipelago are deserted like this picture post-card example. 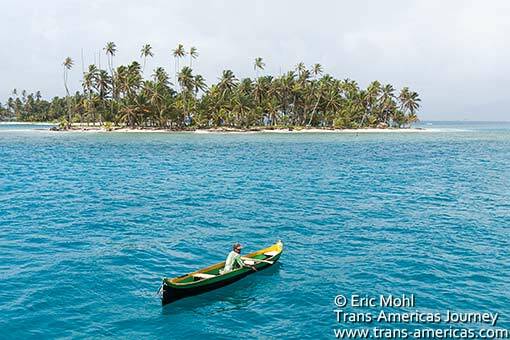 The San Blas Islands in Panama are also known as the Kuna Yala as they are the homeland of the autonomous Kuna people who often make a living as fishermen. 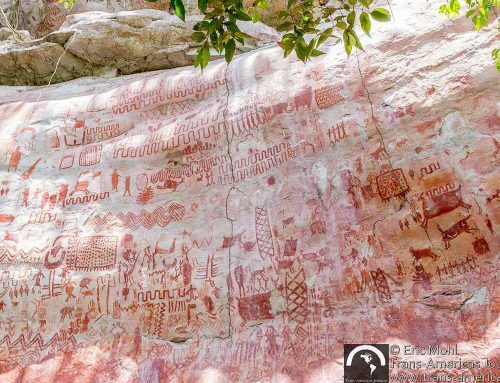 Welcome to the world of the Kuna people, one of Panama’s seven indigenous groups. The Kuna came to Panama from Colombia and in 1925 they fought for and won autonomy from the Panamanian government. The Kuna currently inhabit nearly 50 of the islands in the San Blas Archipelago, which is also known as Kuna Yala. The rest of the islands–more than 300 of them–are deserted. A few of the more than 300 uninhabited islands in the San Blas Archipelago. These one can barely keep their heads above water. Our first days on the M/S Independence were spent lazily nosing around the San Blas Islands – each one more picturesque than the next. 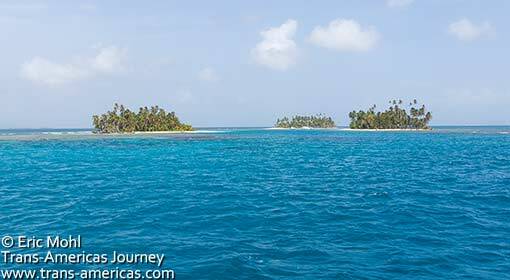 Our four day sailing trip through the San Blas began as a slow, gentle meander among these islands, each more picturesque than the last. 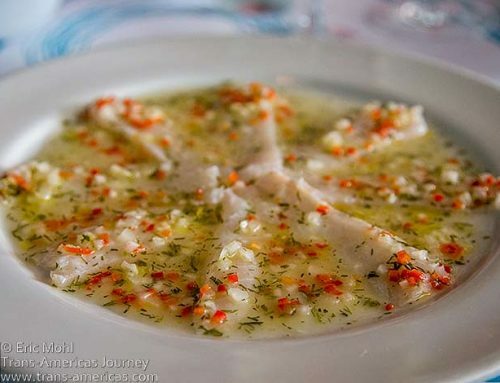 Our days were filled with snorkeling over the reefs that perilously punctuate these waters, swimming around our sailboat and lazing on board listening to music, eating, and getting to know the other passengers and our salty Slovakian captain Michel. 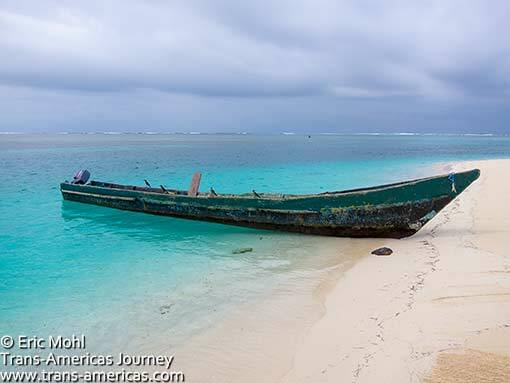 A fishing boat waits patiently in the San Blas Islands of Panama. Soaking in the gentle surf protected by the reefs that surround the San Blas Islands. 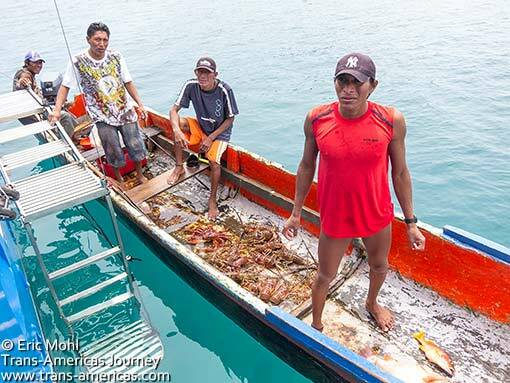 Kuna fishermen sidled up to the M/S Independence selling freshly caught lobster. 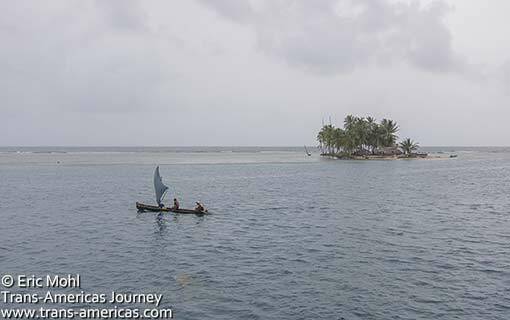 A home made Kuna sailboat plies the calm, protected waters around the San Blas Islands. Snorkeling and sailing are the two big activities of any San Blas Islands trip and for good reason as you can see in our video, below. We were also able to visit a few of the islands for special shore excursions in a small dingy including a campfire with a Kuna family on Chichime Island one night and a grilled fish dinner prepared on Elefante Island where the Kuna inhabitants have built a beach bar with cold drinks, WiFi and a volleyball court (for some reason the Kuna love volleyball – maybe because none of the islands is big enough for a soccer field). 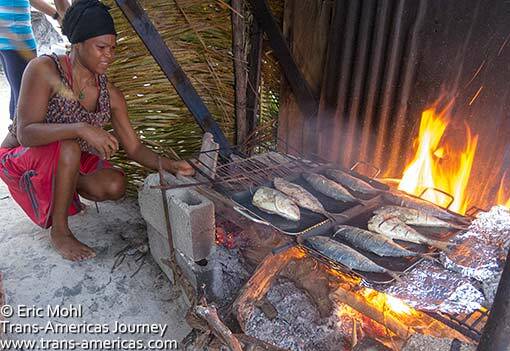 We enjoyed a grilled fish beach party on Elefante Islands during our San Blas Islands sailing adventure. Another perfect sunset in the San Blas Islands. After three days this lazy rhythm was interrupted and it was time to batten down the hatches, literally and figuratively, for the open water crossing from Coco Bandera island to the port in Cartagena, Colombia. Up until that point it had been smooth sailing as our captain weaved between the islands seeking sheltered water. Now it was time for the inevitable open water crossing to Cartagena. 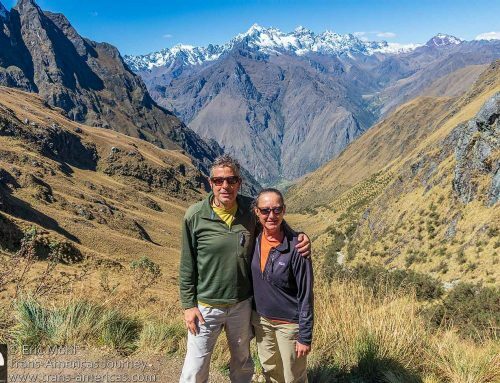 Depending on weather conditions and the size and speed of your sailboat this trip can be a 50 hour (or more) stomach churning ordeal or a 25 hour relatively even-keeled jaunt. We, thankfully, had the latter, though Karen still put on her Sea-Bands and took some Dramamine just in case. 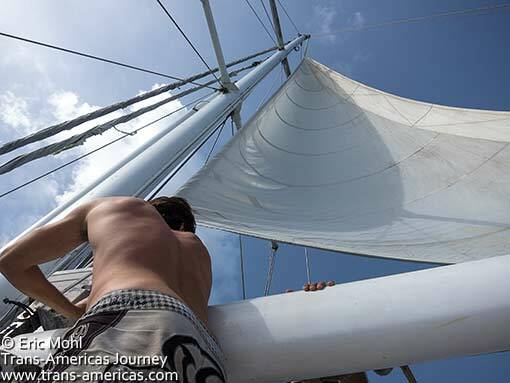 Putting up the sails on the M/S Independence as we prepare for the open water crossing into Cartagena. The time-lapse video, below, lets you watch us head into open ocean aboard the M/S Independence in footage shot with a GoPro attached to the mast (thanks, Cous Cous). Don’t miss the pod of dolphins that escorted us part of the way. Pop a Dramamine and enjoy! 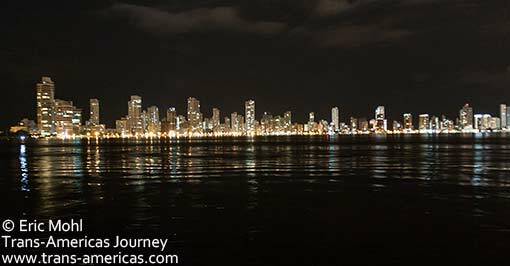 We sailed into the Cartagena port around 9 pm and we were greeted by the twinkling lights and impressive skyline of Cartagena. In the morning we left the sailboat and took the dingy to shore and caught a taxi to the nearby immigration office where our passports were stamped with our free 90 day tourist visa for Colombia. 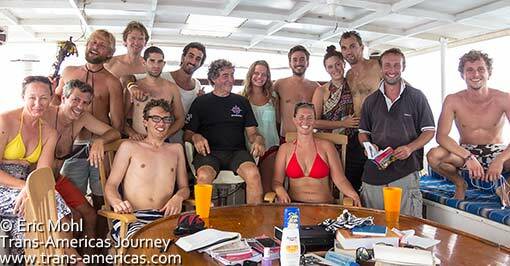 Our San Blas Islands sailing adventure was officially over and our South America adventure had just begun. The skyline of Cartagena twinkled hello as we arrived in the harbor at the end of our San Blas sailing adventure and the beginning of our South American adventure. 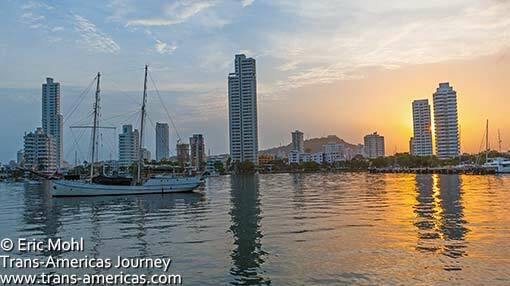 Our first South American sunrise as day breaks over Cartagena, as seen from the deck of the M/S Independence in the harbor. Our advice to you is go now! 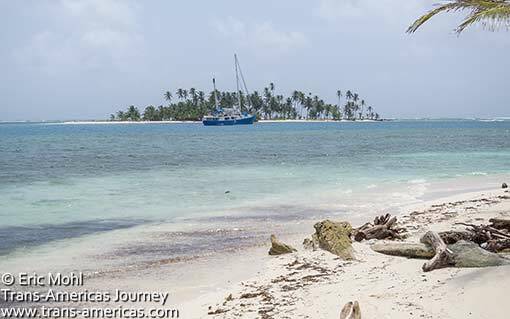 Global warming and rising sea levels are threatening to submerge many of the San Blas Islands. The problem is so real that the autonomous Kuna Congress has started a program that would give island-dwelling Kuna families plots of land on higher ground on the mainland. 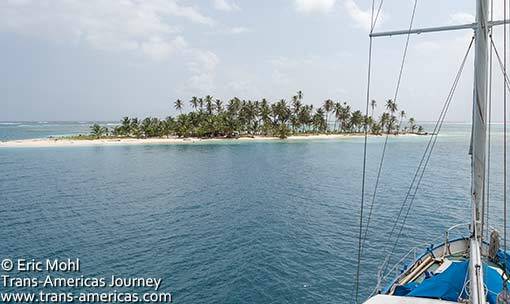 There are literally dozens of sailboats offering to take passengers on the 3-5 day trip from Panama’s Caribbean coast to Cartagena in Colombia (or vice versa) or simply on a multi-day trip through the San Blas and back to mainland Panama. However, these services are totally unregulated and not all sailboats are created equally. Stories of insane captains, insufficient safety equipment, starvation rations, and even sinking ships abound. 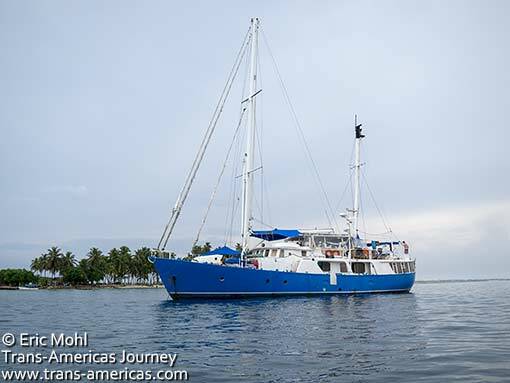 We chose the M/S Independence, pictured above, for our San Blas sailing adventure because it’s a large, fast, stable boat and because the sailing dates worked with our schedule. But there are other factors you should consider too. 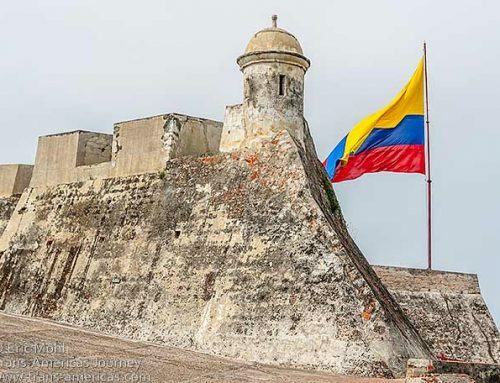 Sailing dates – The Independence (US$550 per person including the sailing and three meals a day) was scheduled to arrive in Cartagena on the same day that our truck arrived on its container ship which was crucial for us. Size – At 85 feet (25 meters) long the Independence is the largest sailboat doing regularly scheduled weekly trips and it’s twice the size of some of the smaller sailboats. That provides ample space and shaded areas on deck and means that the boat weathers the sometimes-high seas in the final open water stretch to Cartagena better than smaller boats. Speed – The Independence is a faster boat than many which means it can make the open water crossing from the San Blas Islands into Cartagena in 25-36 hours (depending on conditions) vs. up to 50 hours on slower boats. Showers – The Independence advertises one fresh-water shower per day so passengers can get the salt water off their skin. Sadly, this turned out to be an exaggeration (more on that below). 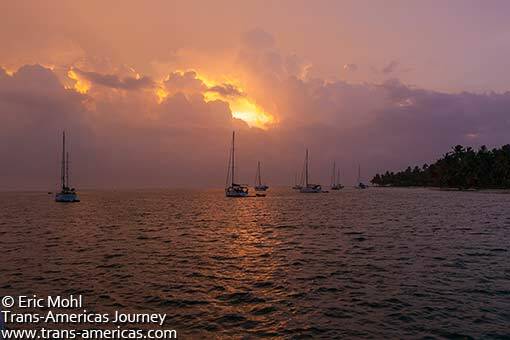 Departure point – Sailboats to the San Blas Islands leave from the Caribbean coast of Panama from either Portobello (or very nearby) or from Porvenir. The Independence leaves from the latter. The benefit of this is that departing from Porvenir cuts 10 hours of open water sailing off the trip and lets you start your trip in the San Blas Archipelago. The downside is that it’s much cheaper to reach the embarkation points in or near Portobello. Our trip out to the Independence in Porvenir cost US$57 per person for a shared vehicle from Panama City to Carti, Kuna community taxes along the way and the final small boat ride to the Independence docked in Porvenir. sailboat has enough life jackets and enough properly inspected and certified life boats for all passengers. 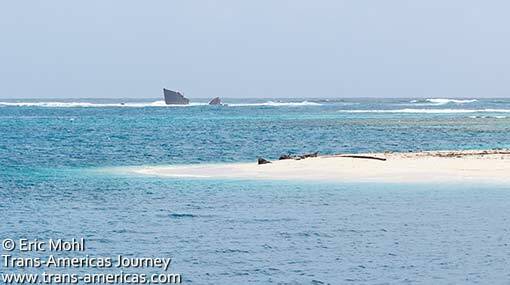 The reefs around the San Blas Islands are littered with the carcasses of sailboats that ran aground. An experienced captain is a must as well. Choose your San Blas sailboat wisely. Wrecks, like the one above, dot the reefs around these islands. Desalinated water is, technically, drinkable but the “drinking” water on the Independence was foul. Drinking water quality on other boats may be better, but to be safe bring enough bottled drinking water with you. Buy what you think you’ll need then double it. It’s hot out there. Most boats let passengers bring snacks and beverages including water, sodas, and booze on board and provide a guest refrigerator to keep them cold. Once on the boat you will probably need to keep close tabs on any beverages or snacks you’ve brought on board. Most of the beer we put in to the shared cooler on board the Independence disappeared down other people’s throats early in the trip. We recommend leaving your food and drinks in bags labeled with your name. You will also probably need to bring your own towel but bedding should be provided on the boat. Double check. And speaking of bedding, you will probably want to sleep up on deck where it’s cooler and fresher than down below so if you have a sleeping mat bring it along. If you have your own snorkeling gear bring that too. Most boats offer snorkel gear but there may be a rental charge and the gear may not be in such great shape. If you’re prone to seasickness come prepared. Eric is generally unaffected but Karen wore her Sea-Band pressure point wrist bands and took Dramamine. Note that we could not find Scopolamine patches for sale in Panama City. Scopolamine has been used by criminals to drug victims, including tourists, and we figure that’s at least part of the reason why it’s not for sale. Should you sail on the Independence? We were generally happy with the Independence. We felt completely safe during the entire journey. There was more than enough safety equipment (life vests and life boats) and Captain Michel is an experienced and knowledgeable sailor with nearly half a century and 240,000 miles of ocean under his belt. We truly appreciated the space on board, including shaded areas though our crossing was only about half full and a full capacity boat would have felt much more cramped. We also appreciated the speed of our open water crossing which we completed in around 24 hours. We were disappointed, however, by the daily fresh water “shower” which amounted to a minuscule trickle of beige water which required you to fill up a plastic cup, douse, and repeat. Frustrating and unsatisfying to say the least but better than staying salty for four days. It also has to be said that as of this writing the Independence is a pretty filthy boat with general scum and grime everywhere and a very healthy population of cockroaches. Cleanliness is a common issue on sailboats offering trips through the San Blas (these are hard working vessels not yachts, after all) so be prepared for it (bring hand sanitizer for starters). 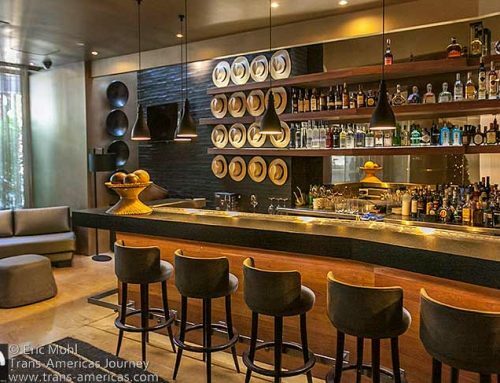 One of the more affordable options (around US$350 per person) that comes highly recommended is the Darien Gapster. We considered taking the Darien Gapster but the sailing dates did not coincide with the arrival of our truck in Cartagena, this service drops you off far from the city because the Gapster is a very small open boat that is not up to the challenges of an open water crossing. We also hear good things about the Stahlratte which is another large and fast sailboat and overlanding friends who took the Jacqueline (a 56 foot catamaran) had great things to say about the size, speed, and cleanliness of that boa, though we have been advised by more than one sailor not to make the trip on a catamaran because in open water they essentially impact the waves twice – once on each hull. 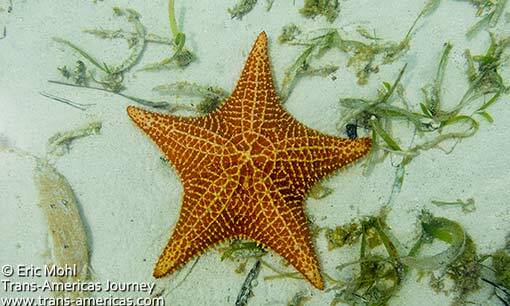 A San Blas Island starfish. 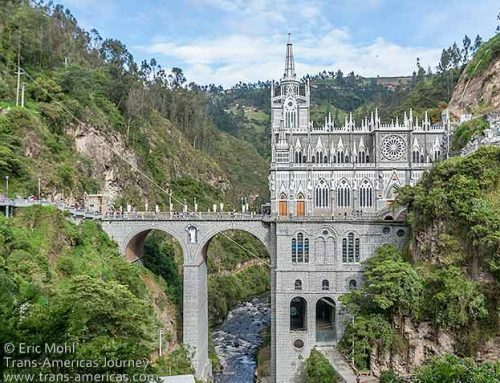 So that’s how we made the “overland” border crossing from Panama to Colombia. If you know of an even more complicated overland border crossing between two adjoining countries, tell us all about it in the comments section below! The motley crew of the M/S Independence (that’s us in the far left). travelers and things book up. 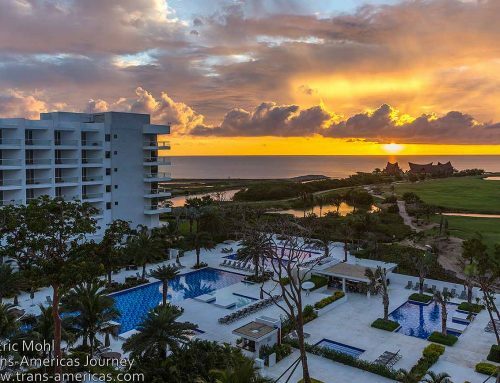 You will be tired and dirty when you arrive in Cartagena so we recommend making a reservation even if that’s not normally your style. 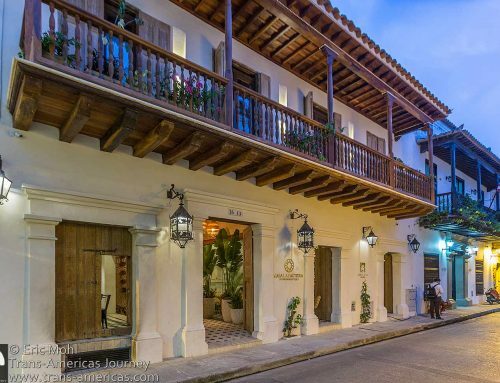 Hotel Villa Colonial, in the fabulous Getsemani neighborhood near the city’s colonial center, is a mid-range budget option that we can highly recommend. 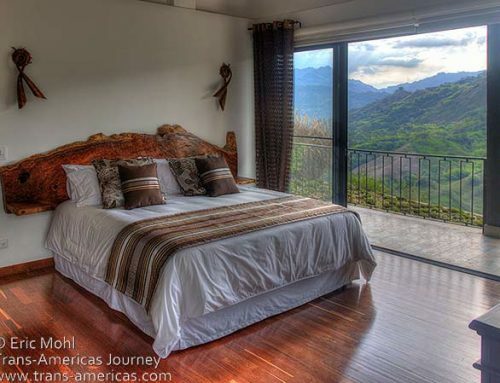 Villa Colonial does not have dorm rooms, but its prices for private rooms (doubles or triples) is the same or even cheaper than area hostels and there’s a kitchen for guest use. 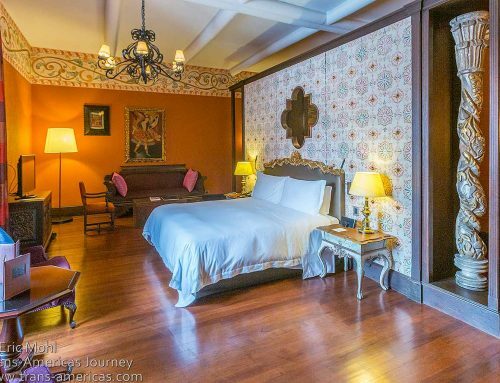 The famous Viajero Hostel, for example, wanted to charge us 52,000 COP (about US$27 per person per night) in a private room for three people with a fan and a shared bath. At Hotel Villa Colonial three of us got a spotless room with A/C and private bath for 120,000 COP (40,000 COP or US$20 per person per night). Martha, the hotel manager, is a living ray of sunshine and not just because she has a voice like Glenda the Good Witch. Thanks for highlighting one of the lands of my ancestors. You made it! I was wondering when the crossing would happen. Another great adventure. Thanks for the detail. 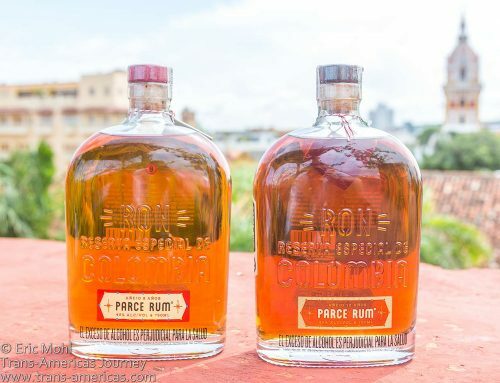 Looking forward to more great stuff from South America. I’ll be excited to read your tales. We were just in the San Blas Islands and it is a wonderful place, we were thinking about going to Cartagena but unfortunately we couldn’t make it was a little expensive for us and we had to come back to Costa Rica, thank you so much for sharing your experience we were wondering how the sailing to cartagena was ! 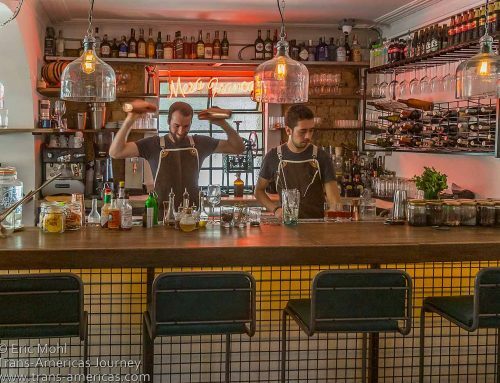 Good post, been to Cartagena a few times but would like to do it again overland from Central America and have wondered about the options from Panama. What a way to arrive to South America! I would love to do this trip some day. Very comprehensive post and that time lapse video is awesome! Wow, that’s so cool that you were able to fasten the GoPro to the mast. Love the dolphin footage! The independance is now on the reef in cayo lemon, san blas. Not operational anymore..
Oh no, that ‘s too bad. What happened? 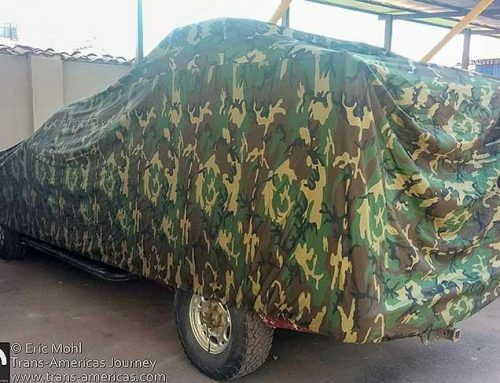 Is Michel getting a new boat? Would love any details you could pass along. He just hit the reef… (like lots of other boats do in san blas..). Not sure what the reason was.. but they were not able to get the boat off the reefs.. i don’t know if Michel found a new boat yet..